I used to buy quite a lot of photography books, too many according to my wife, but not so many these days. My recent acquisitions are mostly coffee table books from photographers I really admire and aspire to. It’s been a while since I bought anything to do with technique. That’s not to say I think I have perfected my techniques, far from it indeed, it’s just that most books in this category are firmly pitched at the novice or endless photo manipulation in Photoshop. I’m pleased to say that Digital Landscape Photography is a little different from the ‘norm’and focusses on good technique and capture process in the field. John and Barbara Gerlach have been professional US photographers for over 25 years, so they bring a wealth of knowledge and experience to this book. They are unusual in that they are a photographing couple and their Wildlife, Nature and Landscape photographs have been widely published in Nature and Photographic journals in the USA since the 1990’s. Rather, strangely (and perhaps expensively), they both use different equipment, one favouring Canon whilst the other uses Nikon equipment (I guess it’s stops fighting over lenses! ), so Camera references in the book usually cover both makes and thus will appeal to both Canon and Nikon users. The book commences with an introduction and chapter stating that landscapes are all around us and if look hard enough we’ll find interesting landscapes near where we live. All well and good if you live in certain parts of the USA (they live in Yellowstone), as the photographs within the book display, but not always the case for UK residents, well not quite as spectacular perhaps. The Gerlach’s stress the importance of revisiting a scene through different seasons of the year and under different conditions, and present a mission statement for the book to enable the reader to learn how to capture high quality, exciting, ditgital landscape images in the field. Chapters 2 and 3 deal with equipment, but I guess by far the majority of readers, if not all, will have already bought their equipment, so for them there is little new here. However, if your upgrading then there is some good advice here. There is one point on which I firmly agree with the Gerlach’s, if you are a landscape photographers and like to make large prints then megapixels do count. I get fed up of journals stating the pixel count is not important, it is. An 8 MP Cameral may produce excellent A4 prints, but if you want A3 or larger then 16 or 21 MP will capture more detail and give scope to crop. 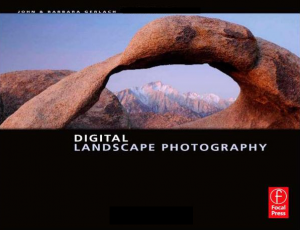 These chapters briefly cover functions you may need for your digital landscape photography, such as using RGB and luminance histograms, the LCD monitors, self timers, cable release, camera custom functions and memory cards. Chapter 3 deals with lens choice and weighs the pros and cons of professional quality glass against consumer quality. Lens choice for most amateurs is typically related to budget and target output, but believe me, once you’ve purchased your first professional quality lens, you’ll never want to settle for less. There is no free lunch with lenses. Zooms versus Primes are discussed, and the Gerlach’s now favour modern zooms over primes. They state the additional quality gained from primes is now minimal compared to modern day professional zooms, and zooms provide so much more scope in creativity and framing your shot, so are in effect, of far more use. Filters and lens protection are also mentioned, as is caring for your lenses. Good stuff for the beginner but nothing new for a seasoned amateur. Chapters 4 and 5 are all about technique and here the book really starts to shine. Chapter 4 provides over 20 pages on Mastering Exposure, and if there was anything you were perhaps unsure on, you’ll most probably find it explained here in truly practical fashion. It starts from the basics but is beautifully and concisely explained whilst still being exceptionally readable. It explains how to use your histogram and expose to the right. One point I gleaned from here was to always check your histogram in RGB mode and not just luminance mode as you may be clipping one of the individual channels which may not be visible in the luminance histogram. What I really like about this book is that there are practical examples given where the Gerlach’s show how they take their photographs. The Gerlach’s tend to shoot in manual mode, but other methods are covered fully too. Chapter 5 is all about getting sharp images and covers lens use, lens selection, how and where to focus, apertures, ISO and shutters speeds. Hyperfocal focusing is explained too. They explain in detail how you can benefit from just selecting a single autofocus point to selectively focus on the right part of the scene, then recompose the scene to shoot. To avoid the camera re-focusing they use a method they call ‘back-button focusing’ whereby they have re-assigned (removed) the auto-focus capability from the shutter button to one of the buttons near the eye-piece. This can generally be achieved via one of the custom functions on Nikon and Canon cameras, but is something I’ve not come across before. Thus your shutter button just sets the exposure, and you use another to focus. Quite a novel method, but I achieve the same result by selectively focusing and then temporarily switching my lens to manual focus before recomposing the scene and shooting the frame. Chapters 6, 7 and 8 are about Light and Composition, with the former dealing with the qualities of light, when to shoot, polarizers, colour settings and white balance. Surprisingly the use of split neutral-density filters are only briefly touched upon and referred to as ‘old-fashioned’ with the Gerlach’s firmly in favour of the use of HDR techniques rather than split grads. To me this is an oversight as a set of grads is still an important part of any landscape photographers tool kit. Chapter 8 deals with shooting more unusual landscape subject such as shooting from boats and contains a good section on shooting waterfalls, and covers Autumn colours and shooting in the snow. Chapter 9 is devoted to HDR, something the Gerlachs’s have embraced in their landscape photography, and it deals well with how to capture an array of images for HDR processing. For processing it only covers (the 2009 version) of Photomatix Pro, so if you use other software you are left feeling short. Some nice HDR landscapes accompany a written walk through of how to process your image but it is all pretty basic and most readers may be well advised to look elsewhere for in-depth HDR advice. Likewise Chapter 9 touches on panoramas, with good basic advice on how to select, compose and shoot but only briefly mentions stitching software. The Gerlach’s possess some considerable photographic experience to pass on to the reader but this book is firmly pitched at the beginner/intermediate photographer who wants to take their photography onto the next level. All the best techniques are well explained and nicely presented and it would be hard not to benefit from reading this book. The emphasis is firmly on capturing good images in the field and in that it excels, but if it’s post rocessing your looking for then look elsewhere.